Dwayn and Peggy are both lifelong residents of Fentress County. Born in the Round Mountain community to Exon and Velma Delk, Dwayn graduated from York Institute in 1966 and a year later joined the Army where he served two years. He returned home in 1969 after spending one year in Vietnam. He and Peggy were married in 1970 and moved to Allardt in 1974. Dwayn worked at Jamestown Broilers until it closed in 1980. and then raised chickens until his retirement in 2014. Over the years, Dwayn enjoyed spending much time with his friends Jim Asberry, Dave Terry, Scottie Blair, George Kilgore, and Larry Cooper at the Allardt Food Market. The conversation always seemed to get around to giant pumpkins, and encouraged by his friends, Dwayn decided to try his hand at growing a giant pumpkin of his own. As it turned out, Dwayne was a big success at growing pumpkins. His giant entries won the Allardt Weigh-off in 1994, 1995, and 1998. And his Fentress County Fair pumpkin entry won the first place title in 1995. Dwayn has served with the Allardt Volunteer Fire Department since 1995 and has been a board member of the Fentress County Farm Bureau for several years. One of nine children, Dwayn's wife Peggy was born in Grimsley, to Haskell and Odell Beaty. She graduated from Clarkrange High School in 1969, where she was a member of the Lady Buffaloes Basketball Team. After graduation, Peggy worked in the clothing industry and in retail at several locations in Fentress County before joining Walmart in 2004, where she worked until her retirement in 2015. Dwayn and Peggy have two children- Anita and husband Bryant Johnson, and Anthony and wife Marlena Tompkins. – and four grandchildren – Wesley, Dillon, Emily, and Madison. Peggy enjoys cooking, gardening, and spending time with family. Dwayn likes to fish, camp, and watch his grandchildren compete in various sports. 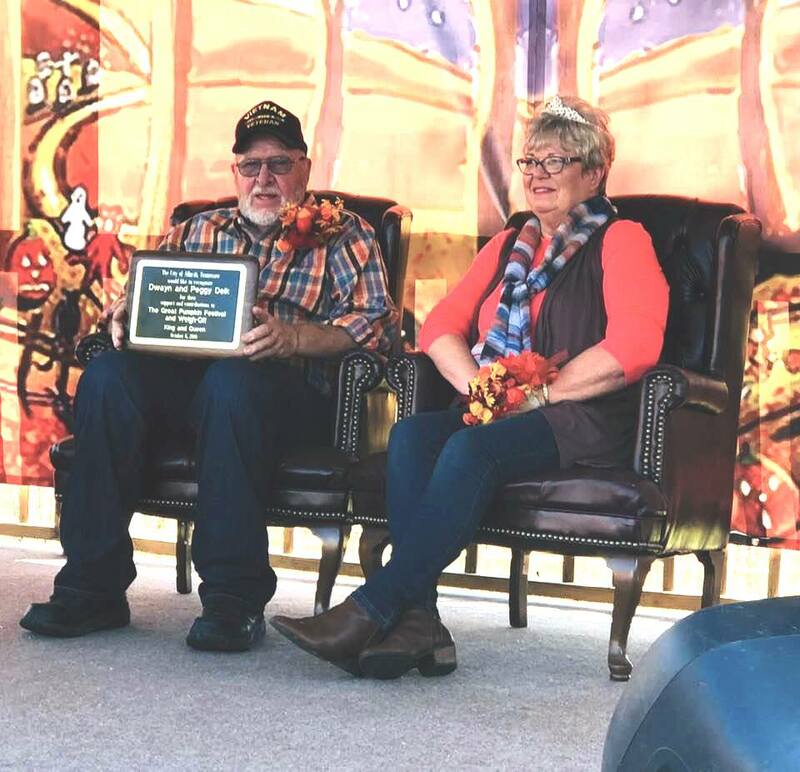 The City of Allardt and the Pumpkin Festival Committee would like to thank Dwayn and Peggy for their life-long community service and support of the Great Pumpkin Festival and Weigh Off.